The 2011 Annual Conference took place on 1st of December 2011 in the Clanard Court Hotel, Athy, Co Kildare, thankfully the weather was much more benign than in 2010 and a fine crowd was in attendance. There were five speakers on the day, the morning session was taken up with matters of national and EU policy and the afternoon session covered agrinomic issues. Our first speaker was Aidan O’Driscoll from the Department of Agriculture, Food and the Marine. Aidan explained to the attendance the background to the current negotiations on CAP reform and how the Department viewed the various options. 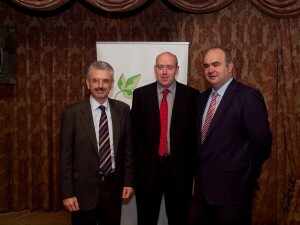 Aidan also spoke on the Harvest 2020 plan for Irish agriculture and the possibilities for tillage farmers. Aidans presentation can be found here and a report in the Irish Farmers Journal here. The nest speaker was Bill Callinane again from the Department of Agriculture, Food and the Marine. Bill spoke to us about the new restrictions being introduced on hedgerow removal and farm drainage, he explained the background to the changes, the new procedures that must be followed befor work can begin and the thresholds that would apply before farmers would have to complete an Environmental Impact Statement. In our afternoon session the focus was on maintaining high grain yields, our first speaker was Dr Patrick Forrestal who spoke on the physiological requirements for high yields. Dr Forrestal’s paper discussed the componemts of yield in cereals and the management and environmental factors that influence them. 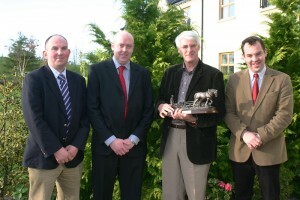 Patricks presentation can be found here and a report on it in the Irish farmers Journal here. Our next speaker was Dr Stan Lalor of Teagasc, Dr Lalor’s paper was on the subject of basic nutrition for high yielding crops, he spoke of the offtake from the previous crops, the need to replace those and if the soil is low in nutrients the need to build up the ferttility. Dr Lalor also covered trends in the results of national soil test results and their implications in view of the nitrates directive. Our last speaker of the day was Dr Tom McCabe who spoke about the challenges of protecting crops against fungal disease. Dr McCabe discussed the changes that have occured in fungicide use and how resistance has arisen to various chemical products and families in different crops, he went on to talk about the new products coming to market and the need to protect them for as long as possible. Tom’s presentation can be found here, and a report on it in the Irish Farmers Journal here. During the AGM of ITLUS two presentations were made. 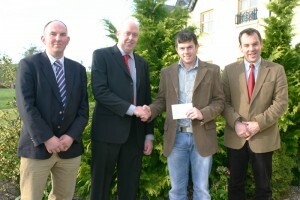 Barry Larkin was awarded the ITLUS bursary in recognition of his achievements in crop science in UCD. Dr Barry O’Reilly makes the presentation of the Itlus bursary to Barry Larkin. In recognition of his long service to ITLUS and to mark his retirement from UCD a small presentation was made to Dr Trevor Storey.